I am convinced that eating bad food is what makes one fat. My logic goes something like this: when you eat bad food, you are left feeling unsatisfied. So if you’re anything like me, you will want to eat something good, something a little comforting to make you feel better. This is why eating bad food is what makes you fat, because you just end up eating more. Take a look at the French for example. Despite all the wonderful trappings of lots of good food, they are generally not very hefty. So, as I sit here about to write about my dining experience at Trishna Restaurant, I find myself tucking into a newly opened tub of ice-cream (Green & Black’s organic vanilla ice cream with chocolate sauce). I feel in need of some comfort food and I am going to assume that my present disposition is enough to tell you that I found Trishna particularly unsatisfying. Ok, it really doesn’t take much to get me to open up a tub of ice cream. It’s quite a regular activity for me in fact, especially when those two-for-a-fiver special offers come up at the supermarket. So I can’t use dissatisfaction with a meal as an excuse, but it really was so very average. In any event, I am hoping I can write about this as fast as possible because it would not do to eat the whole tub, although I am very confident that I would enjoy every little bit of it! Trishna arrived on the London restaurant scene a few months ago and is linked to its namesake restaurant in Mumbai, by all accounts a well-known eatery popular for its seafood and Maharashtrian cooking. I had heard some good things about Trishna, so my expectations were high. But the situation with having high expectations is that when they are not fulfilled they disappoint even further. I haven’t been to Trishna in Mumbai so I cannot comment on how the two compare, but the London branch, headed by executive chef Ravi Deulkar previously of Rasoi Vineet Bhatia, is dowdy, plain and dull. The dining room is split into two sections with simple whitewashed walls, exposed brick, basic furnishings and small tables. It smacks of pretense and aspirations of an upmarket wannabe, although it’s anything but. With an air of seemingly contradictory restaurant philosophy, I find restaurants such as these a hard pill to swallow. The menu is divided up into different sections and is geared to encourage plenty of ordering to draw money from your wallet. Trishna recommends that every diner choose one dish from the various sections (known as pakora, charcoal grill and Trishna), plus one vegetarian dish, (so four dishes), plus breads and rice. Counting slowly on my fingers, I worked out that the sum of all these dishes would probably amount to some £40 a head before drinks and service. At a high-end Indian restaurant I might have understood this approach: there you get slick service, great décor and ambience, and quality, inventive cooking. But at dowdy Trishna I simply could not. And with the décor already a disappointment, the food would have to go a very long way to make up for it. We settled on the ‘Koliwada’ tasting menu with eight courses (£34.50), seemingly a good option for variety and pricing. The menu was crafted in a way to suggest inventive Indian-inspired cooking, but on delivery the food disappointed in both their small portion sizes and lacklustre presentation. The quality of the cooking hardly fared better. 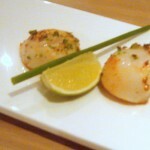 The diver-caught scallops seared with green chilli and garlic, (two solitaire lonely scallops lumped on a plate), and the squid spiced with rice flour, lime zest, and chilli salt were under-seasoned, leaving me reaching for the salt, something I am not normally prone to do. 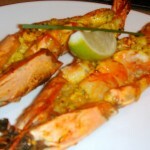 The wild tiger prawns with mustard spice paste were mushy in texture and unevenly flavoured. In one mouthful I was overwhelmed by a burst of mustard sensation, in another I was courted with soft, mushy nothingness. A hariyali bream with mint coriander and green chilli masala was pleasant but unspectacular; lamb chops with ginger and Kashmiri chilli marinade were dry and overpowered by the marinade; and a market fish curry cooked in coastal spice and coconut masala tasted slightly acidic. 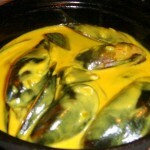 However, a dish of Isle of Shuna mussels simmered in a coconut and turmeric masala was pleasantly tasty in its creaminess, although a side plate of spiced baby potatoes was soggy as if they had been pre-cooked and reheated. By dessert, I was justifiably despondent when the mango rice pudding left an artificial aftertaste on my palate as if it had been laced with saccharine. Service was slow to start off with: it took a while for our orders to be taken, although our flirty waiter provided a slight reprieve from the damp evening. But other than that, the restaurant was truly very average. The ingredients were incredibly fresh, but fresh ingredients are only one part of making a meal work. It also takes good technique, strong ingredient combination, a deft hand at spicing and seasoning (especially in Indian cooking) and stylish presentation skills. Were the meal only £15, I would have perhaps thought an eight course affair a credible effort at providing value for money. But at £34.50, I just thought it a rip-off. So for about £40 a head, it would seem better value to head to your local Indian instead where they’ll probably charge you half the price and where they’ll potentially dish up more flavoursome and authentic food. Or better yet, look out for those two-for-a-fiver special ice cream offers. Just make sure that, unlike me, you don’t eat the whole tub… unless of course, you really want to. Approximate price – £34.50 for the eight course tasting menu, otherwise about £40 for the four courses per head that the restaurant suggests you order. Excludes drinks and service. The tub of ice cream sounds good right about now 🙂 Hey, I have a question for you – do you have a recommendation for a really good (not overly expensive) Indian restaurant near the Renaissance Chancery Court hotel? I would appreciate any feedback you may have. We’ll be in London for a short time in April. Thanks! I agree with you that eating bad food (i.e., processed food) is what makes one fat. I think that when we eat bad food, which tends to have a lot of salt and sugar, we quickly develop cravings for those things in the same or other forms. I can’t really comment on how bad it is to get comfort food at the market even though you know it’s unhealthy; 20 minutes ago I picked up a piece of banana cream pie while waiting in line to pay for some shrimp and raw veggies. (Bad! Bad! … Yum!) Anyway, I hope my shrimp turns out better than the mushy, wild tiger prawns you were served at Trishna’s. This is a well-written review! I have had bad experiences with “upper end” Indian restaurants as well – am always left longing for the cheap curry at my local Indian restaurant. Yes sometimes the local is the best option. And you don’t feel like you’ve overpaid for something you didn’t get. 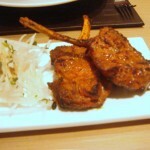 I often find high end Indian restaurants can be a bit dull, churning out very average food at high prices. 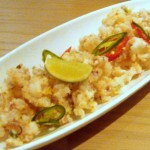 The best Indian restaurant near me is vegetarian and serves really interesting, delicious food and it’s a bargain too! Think you should stick to your ice cream and cheap indian food.You obviously do not appreciate freshly cooked indian food.We have been to Trishna as have lots of our friends who have all raved about the excellent food.This is the only review that is not complimentary and i strongly recommend you go back and sample the food again. I hear they sacked that chef girlie. Go check out this place again. The foods stunning.